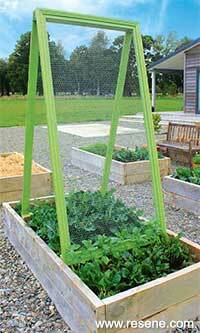 Rose Hughes shows how to make a simple structure to support climbing beans, peas or sweet peas. 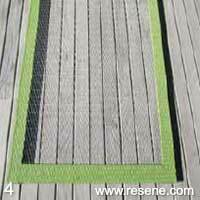 You will need: Fourteen metres of 20mm x 65mm dressed treated pine, eleven metres of 45mm wide decorative architrave (optional), chicken wire, 8g x 32mm galvanised screws, two 50mm hinges, small nails, power saw, power drill, staple gun and staples, wire cutters, sandpaper, filler, paint brushes, Paint undercoat: Resene Quick Dry Primer and a topcoat. For the frame pictured right I used Resene Koru. 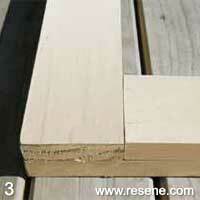 Cutting measurements: Sides: 4 x 1800mm Top, base and filler: 4 x 900mm and 4 x 770mm Feet: 4 x 300mm. Cost: $110 ($80 with no architrave). Mark screw holes into the top and bottom panels, making an allowance for the hinges to the top two panels. Drill and countersink the holes. Lay two of the 1800mm lengths onto a flat surface. Lay two 900mm pieces across each end to form a rectangle. 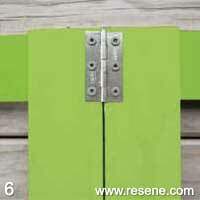 Put on screw into each corner and, after ensuring that the corners are square, add the second screws. Add the additional top and bottom filler panels. Fill the holes, undercoat then topcoat the two frames. 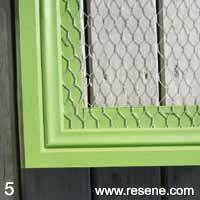 Lay the chicken wire over the outside face of the frames. 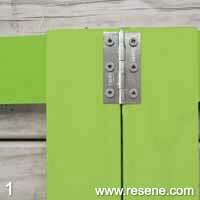 Pull taut and attach using a staple gun. If you want to add the decorative edging, measure and mitre the corners so the architrave edge fits neatly against the outside edge. Undercoat and topcoat then attach with small nails with another top coat to hide the nail heads. 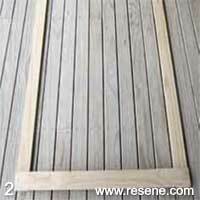 Lay the two frames outside face down, with the tops touching and screw the hinges into position. Cut an angle to the bottom of the feet and attach to the inside of the frames at each side.